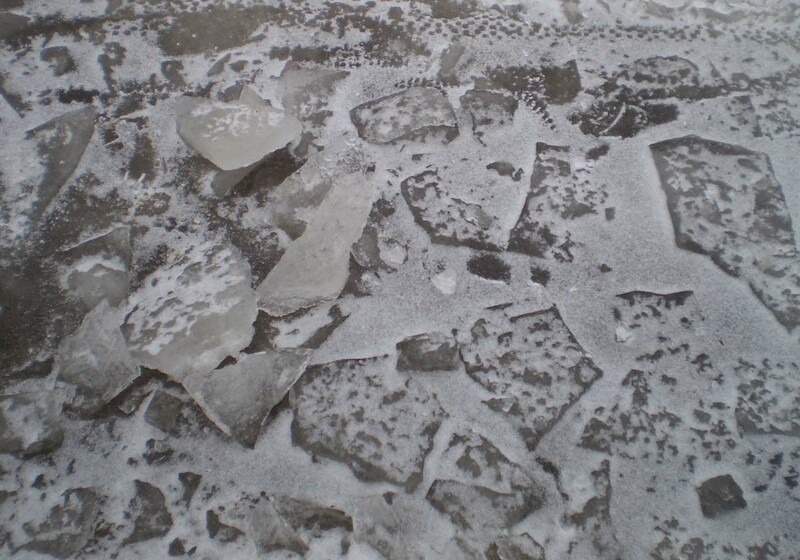 Over the past week, the temperature has finally started to warm up and some of the snow has even started to melt. 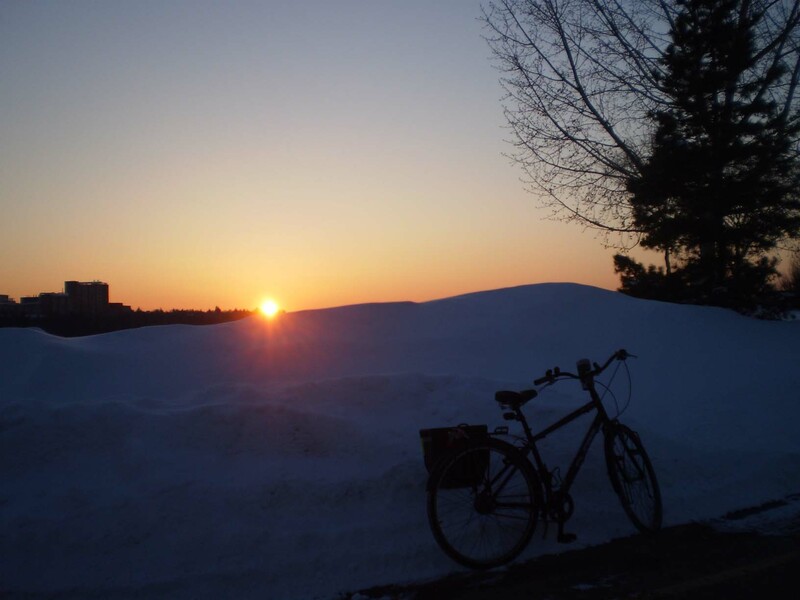 I can’t help but be jealous of many of the other bike bloggers in the northern hemisphere who are already enjoying clear roads and spring weather, as it’s going to take a long time for all this snow to melt here. Sunset over an eight foot high pile of snow. 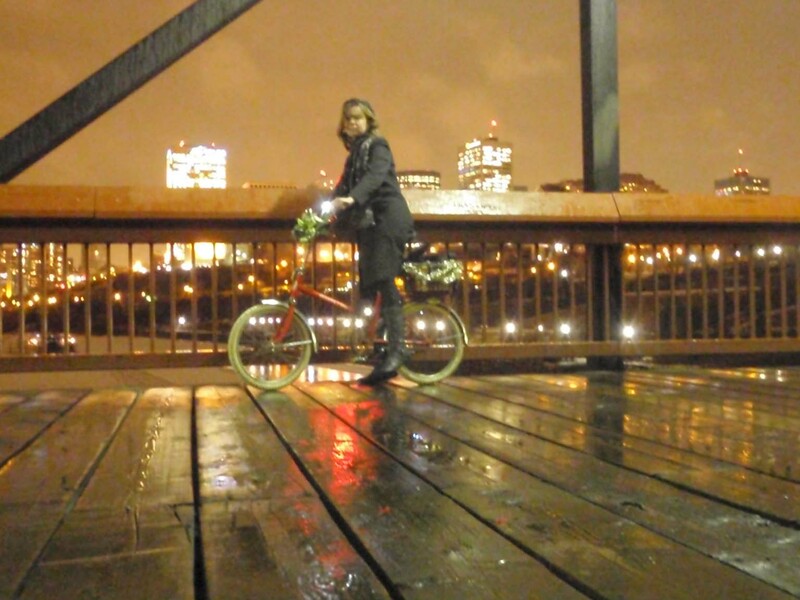 At the EBC Bike Art Auction two weeks ago, I took home a door prize (thanks Karly & MEC! ), a Portland Design Works cup holder to put on my handlebars. I’m not a coffee drinker, so I wasn’t sure how much I’d use it, but I really appreciated having easy access to a hot drink during a cold ride. It warmed me up better than chemical hand warmers! My cup wasn’t 100% watertight though, and would occasionally send out splashes of liquids that would freeze into little balls of tea-cicle on my bars and coat. Come summer, this could also be a solution for transporting my favorite summer beverage, squishees! 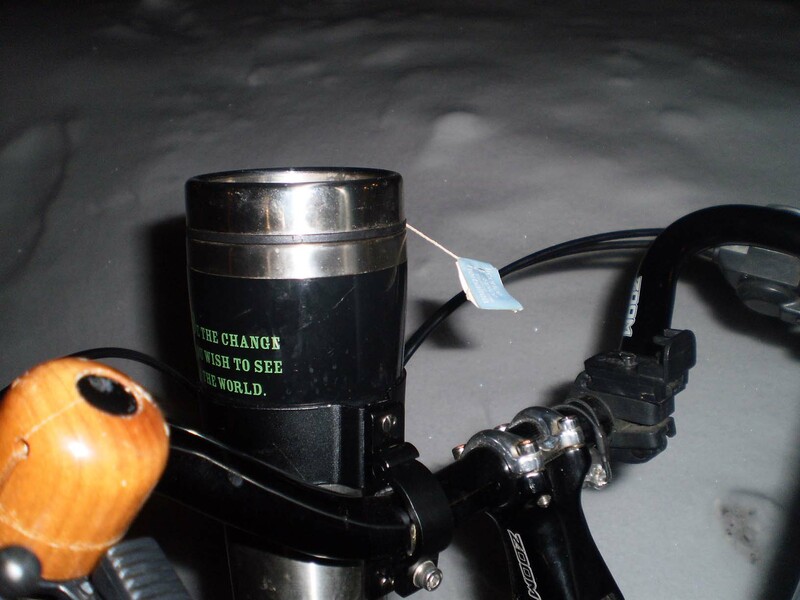 The last week of minus 20 temperatures was mitigated by having hot tea handy. Note the string on the tea bag has frozen in anti-gravity position while I was in motion. 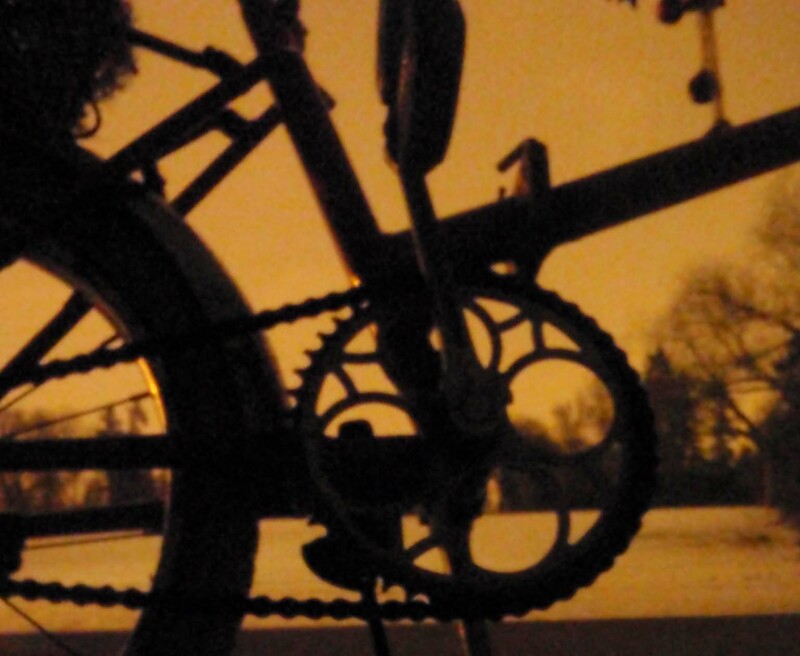 The temperature finally began to rise just in time for the Frozen Weenie Ride, organized by raving bike fiend. 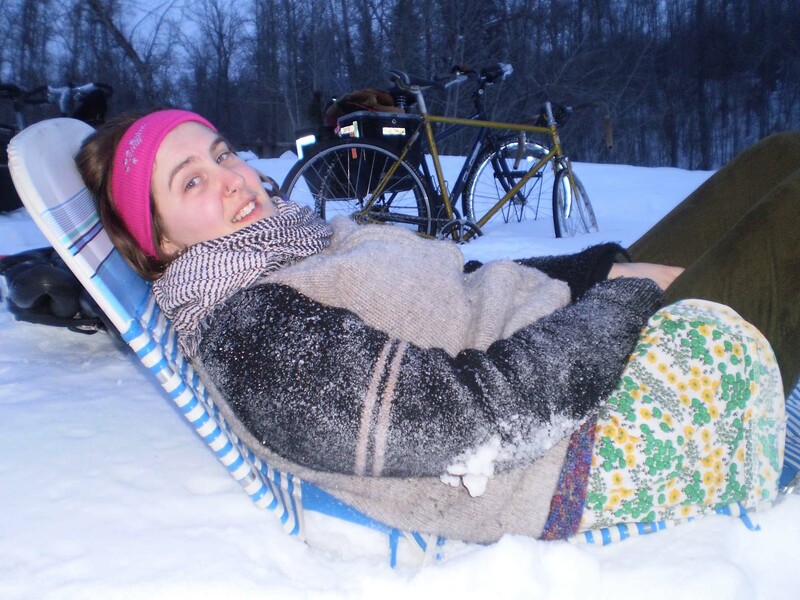 We met up in Mill Creek Ravine by bike and by foot, gorged on fruit & sausage (roasted on bicycle spokes, and you better believe there was vegan sausage) & hot chocolate, frolicked in the snow and gathered round fires. Meagan lounging on one of the lawn chairs that Keith brought in on his long bike. 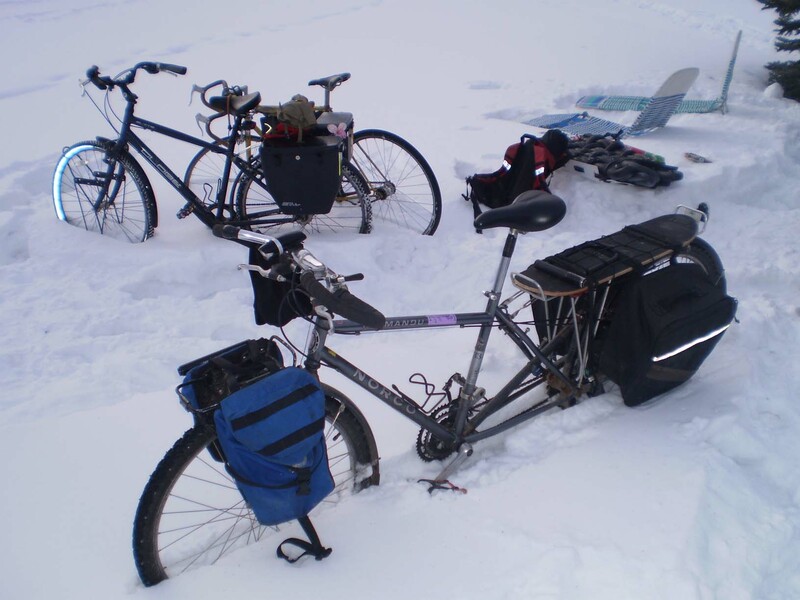 There's still enough snow around to make kickstands redundant. In the foreground, Keith's long bike. 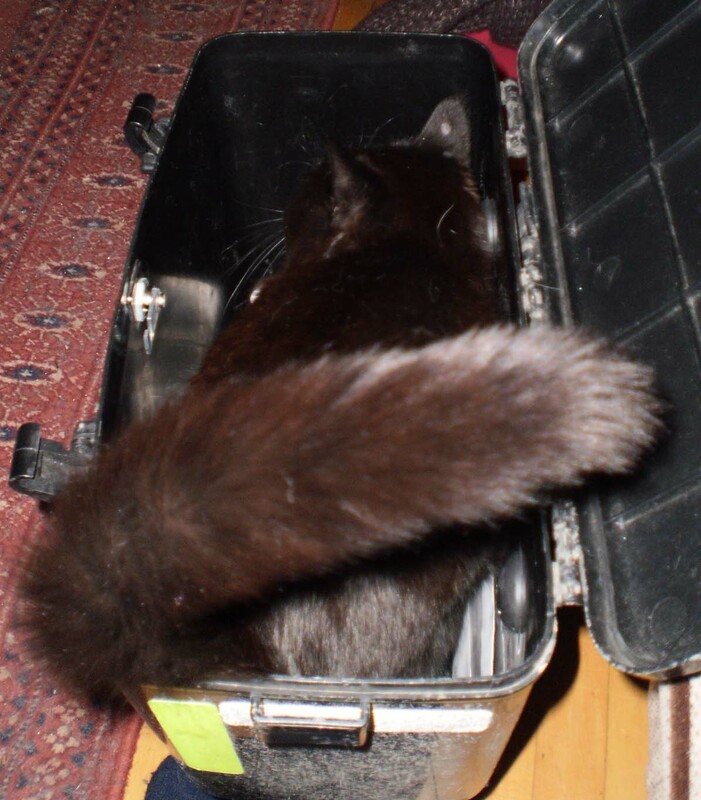 In a fit of late winter cabin fever and slow-day-at-the-bike-shop-itis, I created a toboggan out of 10 old bicycle inner tubes and a corrugated plastic sign that I had eagerly been waiting to test out. 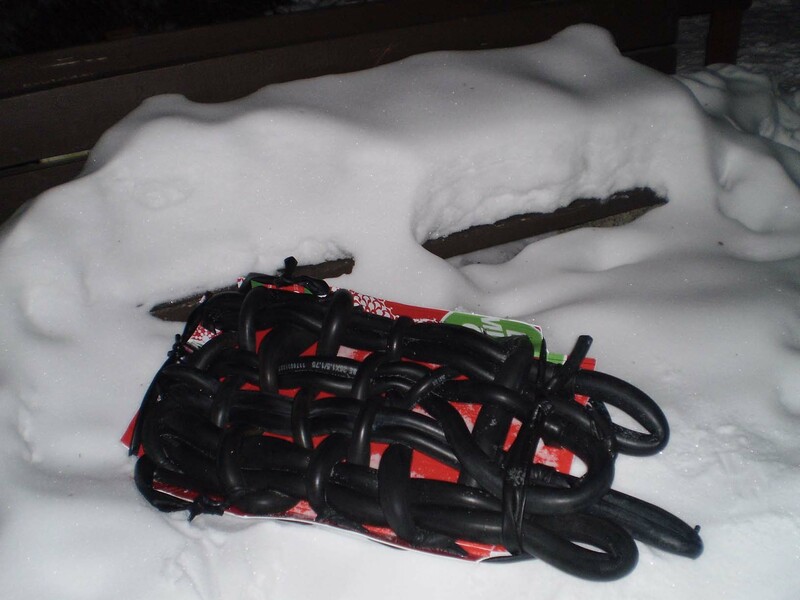 I wove inflated tubes together to create a padded but grippy surface to sit on, then used cut up ones for handles and to secure the inflated tubes to the plastic base. I brought it to the picnic thinking that if I couldn’t find a place to slide, at least I’d have a comfortable place to sit. 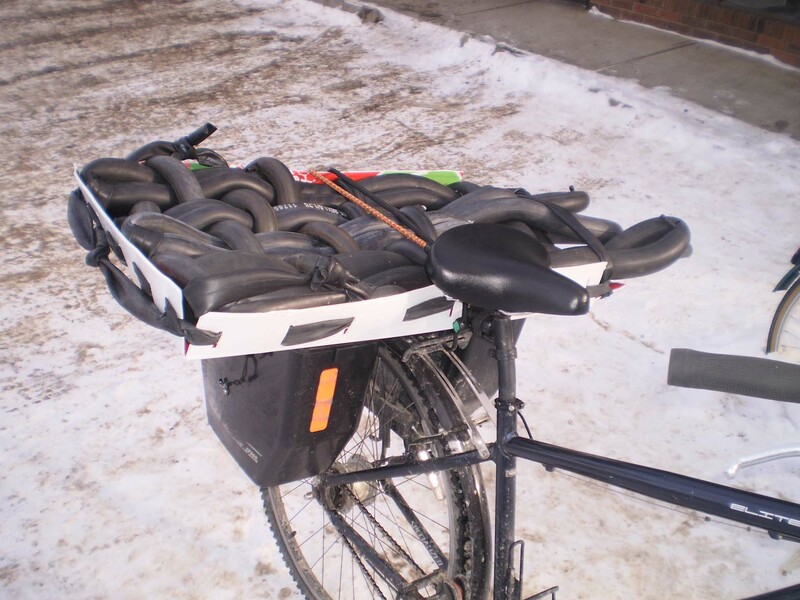 Behold the Tube-oggan, strapped to the back of my bike. 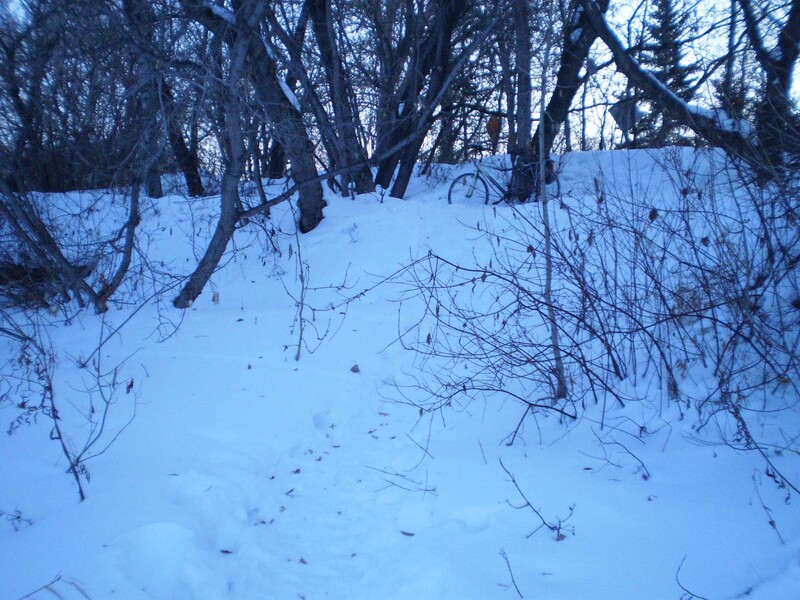 There was a couple of chutes near the picnic site that I had a screaming good time riding that puppy down, and even though there were crashes, the 3 feet of soft snow everywhere kept the damage to a minimum. The tube-oggan performed beyond expectations on it maiden voyage, fast, light weight, predictable, well padded, and best of all, none of the tubes leaked or exploded. In the background, the steep path that became our luge chute, in the foreground, the game is step off the path and sink into snow up to your crotch. 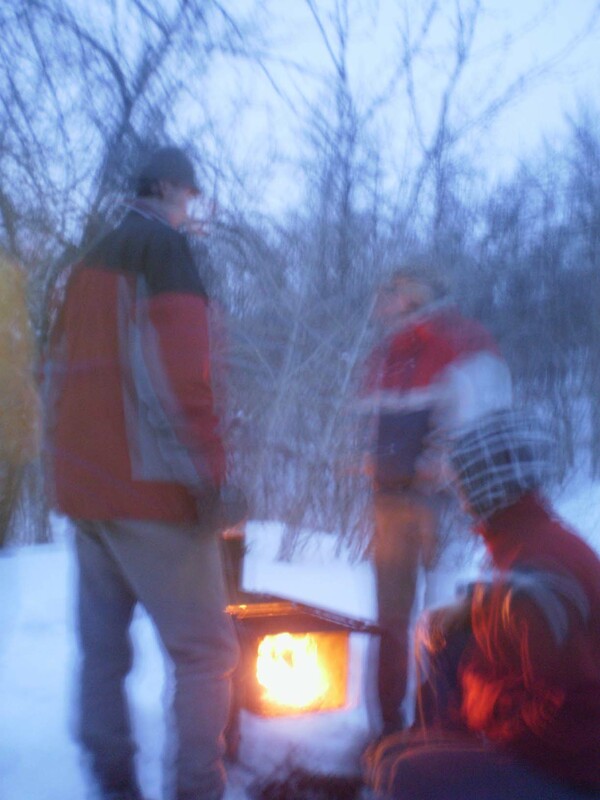 After sliding to the point of near injury, we warmed up around the fire as night fell. Keith, Tracy & Brett gather round the fire. 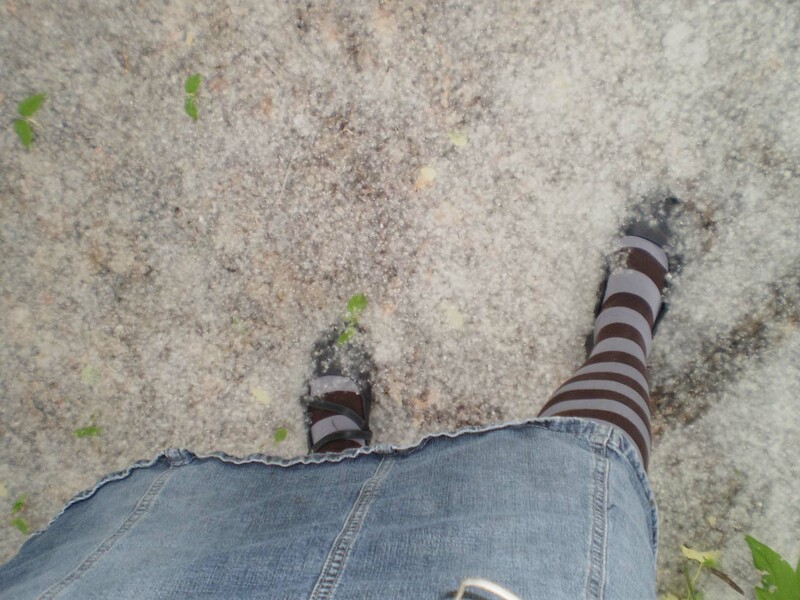 Bah, spring! Who needs it when winter is this awesome? 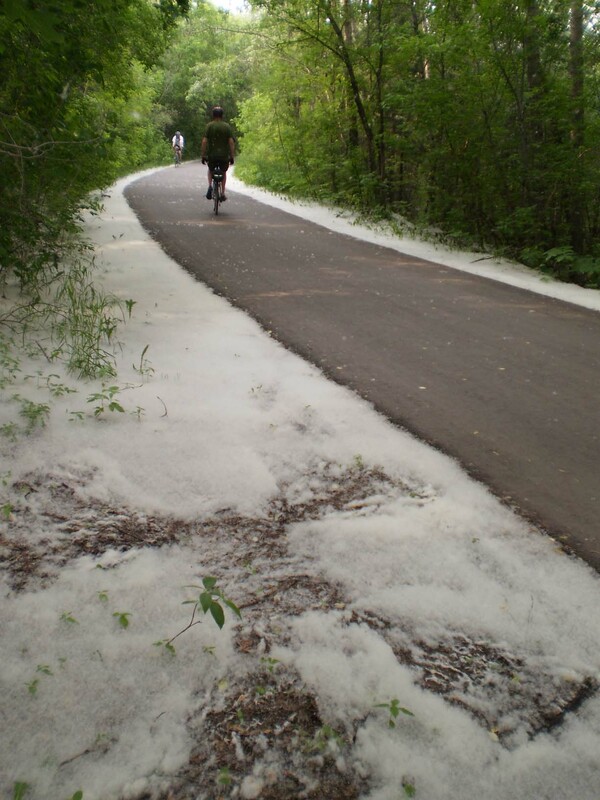 The bike paths were packed with clean, white snow that was a breeze to ride through, but as the freeze-thaw cycles of spring progress, that lovely white snow will turn into black ice, and even though it’s almost over, the worst riding conditions of the winter still await. 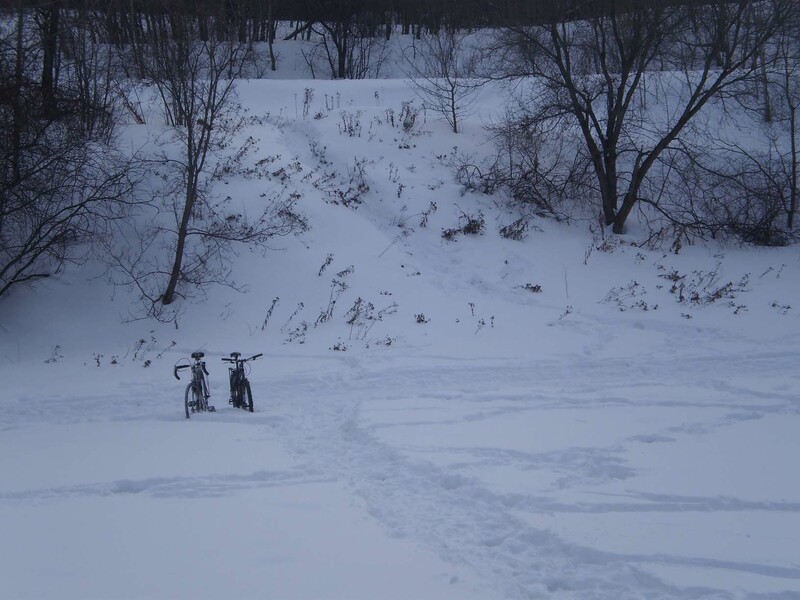 Hills and ice are a combination I try to avoid at all costs, and as a result, I very rarely ride through the river valley in the winter, even though in the summer I credit my regular river valley detours for maintaining my sanity. 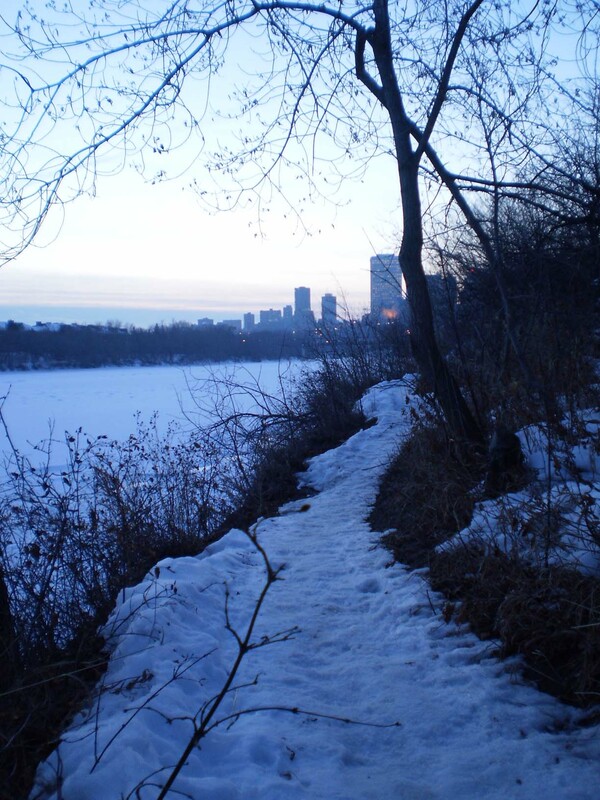 This week it was warm enough, light enough and not quite melted-and-refrozen enough to tempt me to head down the hill into the river valley wilds. 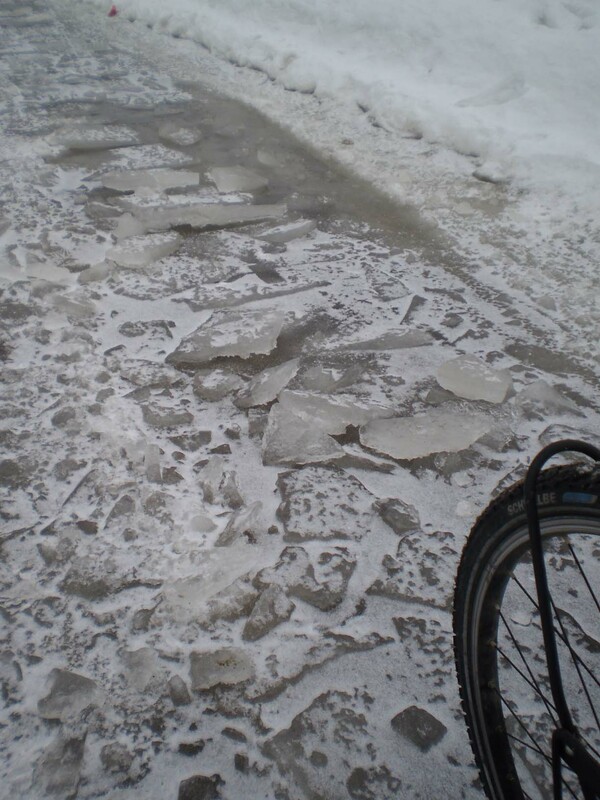 The bike paths were mostly snow covered, and the only icy patches were in the few places that caught the full day’s sun and the brutally glazed wooden pedestrian bridges. 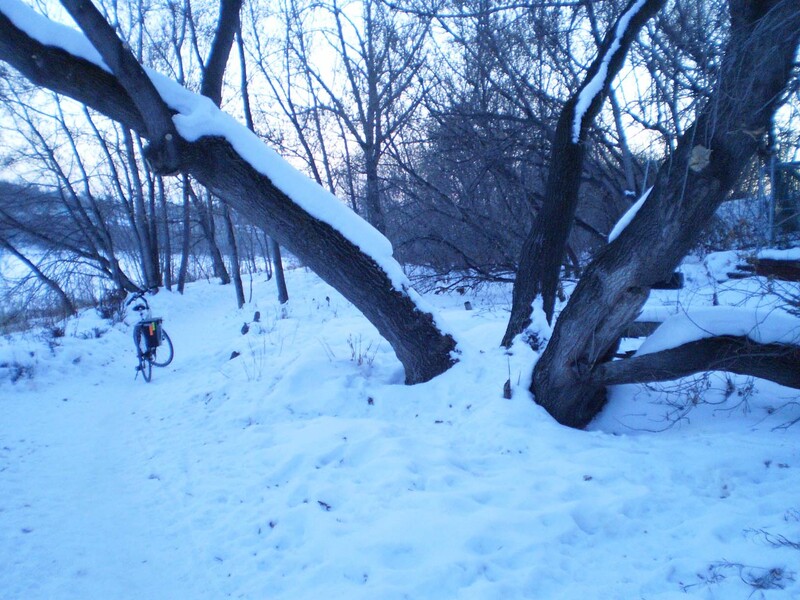 The snow packed trails that snaked down near the river were a perfect match for my studded tire, and felt more forgiving than their loose gravel covered summer counterparts. There’s a place I often go in the summer after a long day in the sweatshop that I call “Secret Beach.” I decided to check out but found it was fairly nondescript underneath 2 feet of snow. I left Ol' Nelli up the hill above Secret Beach. View across the river from Secret Beach. 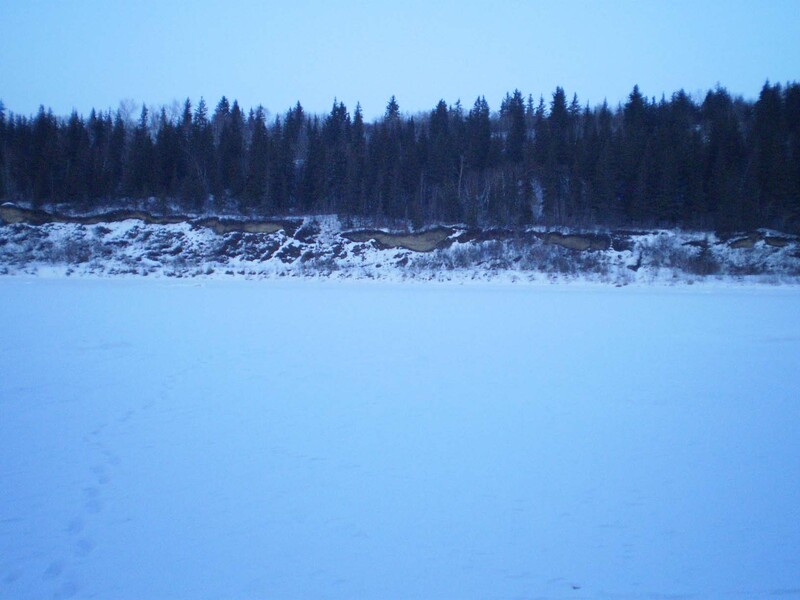 Note the set of tracks that go out onto the river but don't come back. I hope they made it to the other side. This tree is huge by E-ville standards. 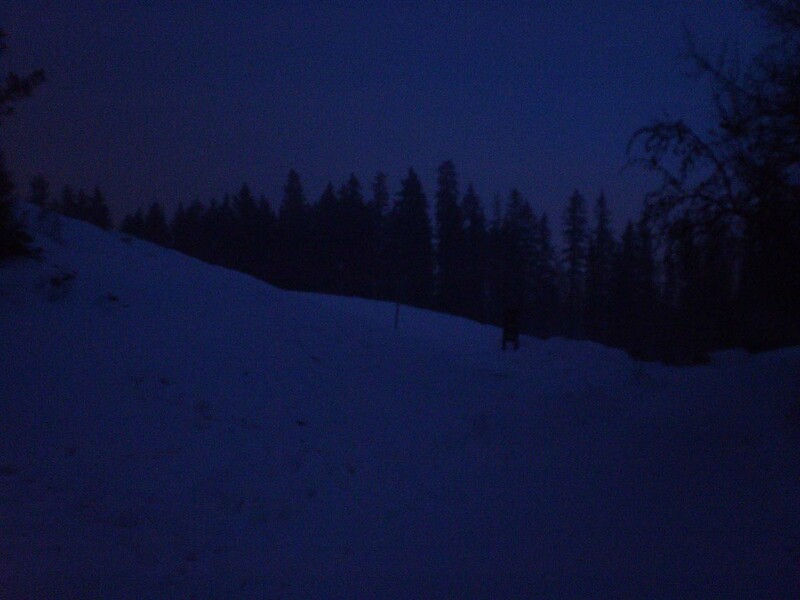 And everything does look this blue around dusk in the winter at this latitude. To the left, a 30 foot drop onto the river bed. This is where I face my fear. 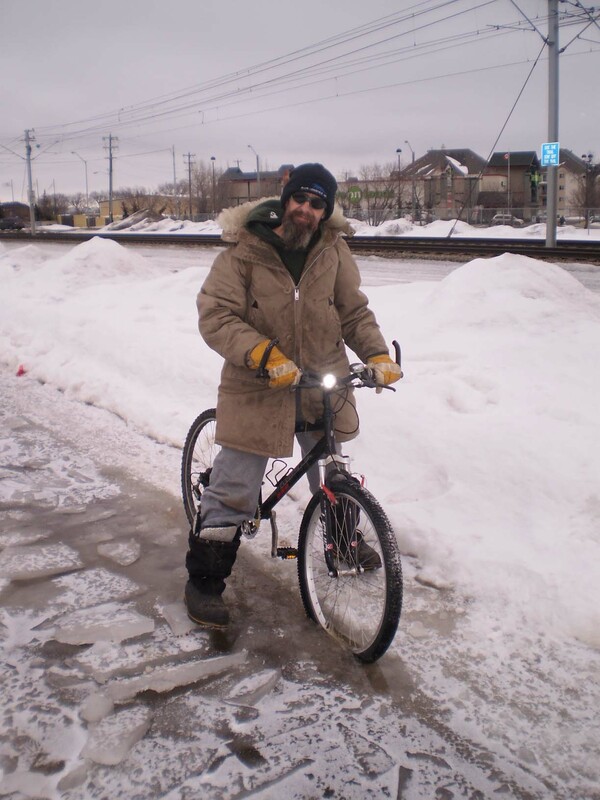 My brain knows that my studded tires have far more traction than my cheap boots, but my body would not budge. It didn’t help that I stopped to take pictures, therefore negating any forward momentum, and allowing more time for fear to build. My brain eventually won this battle, and I cycled up the cliff as I had dozens of times before in fairer weather and on fairer bikes. I’ve been getting over a cold this week, and am still wheezing and coughing a lot, so I wasn’t really feeling like taking a big hill to get out of the valley. The solution: the Edmonton, Yukon & Pacific Railroad, now known as the trail down Mill Creek Ravine. I could chugga chugga outta the valley on a grade so gentle it doesn’t feel like riding uphill on a shady, and thus snowy not icy, trail, and *only* end up riding an extra 40 blocks out of my way. It seemed like a good idea at the time. 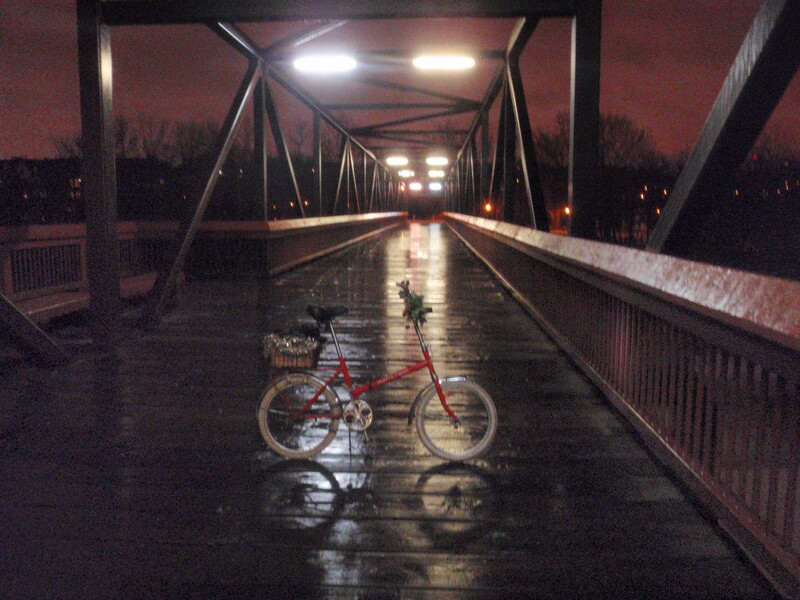 The ravine darkened eerily, and by the time I rode under Whyte Ave, I could feel a fine precipitation in the air but couldn’t tell in the darkness if it was rain, sleet, snow or just fog. 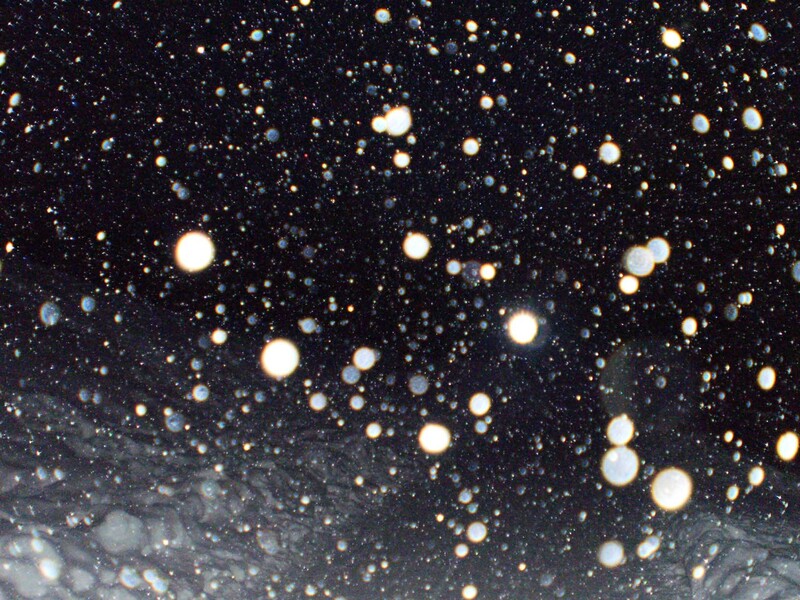 The camera flash illuminates the precipitation but does not help with the liquid/solid question. The combination of mystery precipitation and the last traces of daylight create a moody air. This photo was taken in the same spot as the photo above. 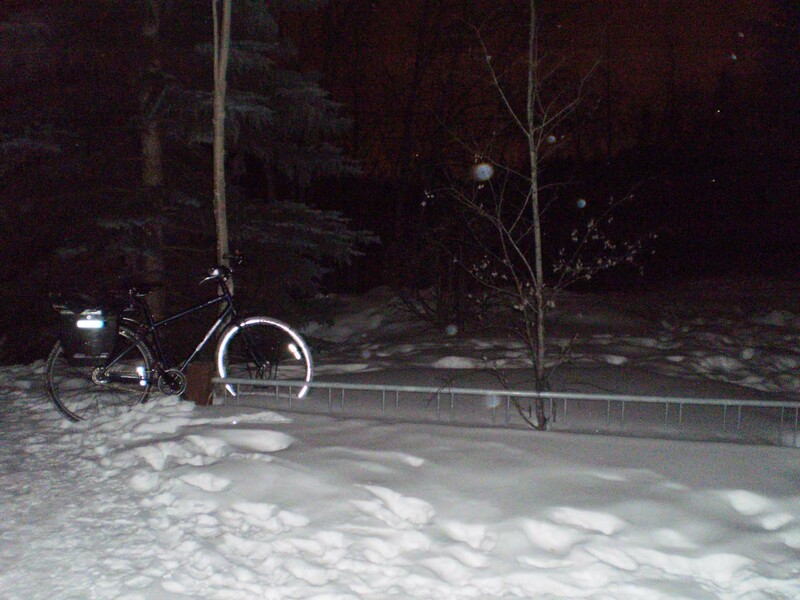 By the time I got out of the ravine, my bike and I were covered in a layer of fine white ice crystals. The fog was thick and inviting and made everything strangely beautiful, but I felt compelled to deal with more pressing matters, like food and rest for my still recovering body. 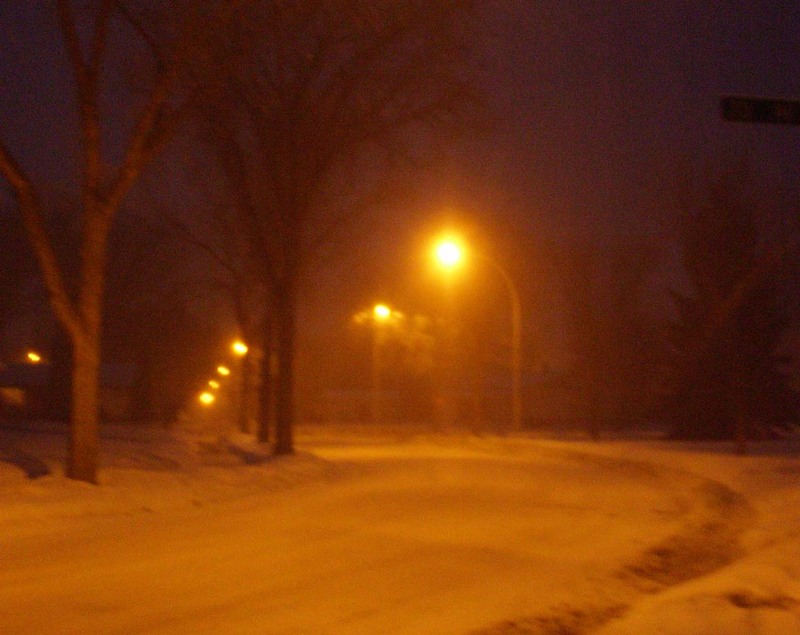 Streetlights highlight rare Edmonton fog.